The discussion of Apple Open Directory versus JumpCloud Directory-as-a-Service® is about whether your directory services should be on-premises or in the cloud. Directory services are at the core of an organization’s IT infrastructure and, some might argue, the center of how a company operates. The core directory service controls who has access to what. In an age when digital assets are some of the most important assets of an organization it is easy to understand why many consider core directory services the center of IT. Apple Open Directory emerged as a directory services solution analogous to Microsoft Active Directory. IT organizations that had a large fleet of Macs to manage would turn to Apple Open Directory, or at least consider it. The solution is a part of the Mac OS X Server platform and tightly integrates user management for Mac devices. This is similar to having Microsoft Active Directory tightly controlling user management for Windows machines. As IT organizations consider Apple Open Directory for their identity management platform there are two considerations to think about initially: Heterogeneous IT environments and cloud infrastructure. As the IT landscape evolved, more of an organization’s IT resources shifted away from the Microsoft Windows platform. Macs and Linux devices now outnumber Windows machines. Applications are taking all forms including Linux-based on-prem applications or web-based applications. Networks are changing from wired to wireless. IT networks are not confined to a single operating system any longer. While this is an especially large change for Microsoft-based networks, Apple-based environments are turning into heterogeneous networks as well. Many of these IT resources are shifting to the cloud as on-prem data centers become relics. AWS and Google Compute Engine among many others are the new virtual data centers for organizations. There are SaaS-based web applications for every function imaginable. As many of an organization’s core resources are in the cloud, the challenge then becomes determining how the directory service connects users to those remote IT resources. For an on-prem directory such as Apple Open Directory, a challenge is networking and securing the connection between the directory and the cloud resource. When IT admins are reluctant to expose the directory service to the Internet, a private, secure connection is needed. This can add work and potentially costs to the equation. JumpCloud’s Directory-as-a-Service securely connects users to IT resources regardless of platform, location, or protocol. Macs,Windows, and Linux machines are all treated as first class citizens. Web applications are treated similarly to on-prem applications and the core user credentials can be used as a True Single Sign-On™ solution. The WiFi network is also authenticated using the same cloud-based directory service. The virtual directory service delivered as a SaaS-based platform avoids the significant work of building and maintaining a highly available directory service. 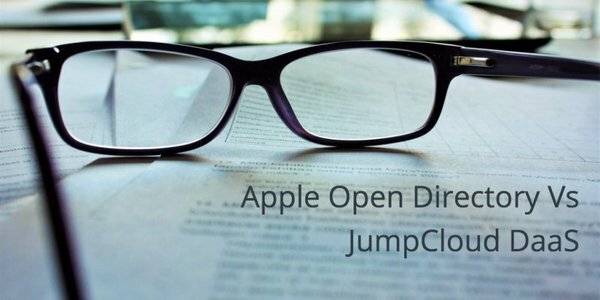 If you would like to learn more about how Apple Open Directory compares to JumpCloud’s Directory-as-a-Service, drop us a note. We’d be a happy to chat with you about it. Or, feel free to sign-up for a free account. Your first 10 users are free forever.